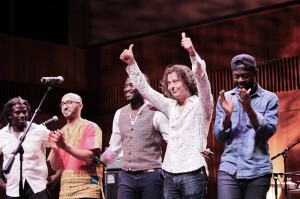 Internationally acclaimed artists Aziz Sahmaoui & University of Gnawa, along with Fareed Ayaz, Abu Muhammad, Qawwal & Brothers hit the stage at yet another exciting CommUNITY Café: World Music Festival. Each group enlivened the audience with vibrant, interactive performances. Attendees were also welcome to meet and greet with each artist after they left the stage. The event, held at the beautiful new Reva and David Logan Center for the Arts kicked off with a special reception featuring DJ Bornswift and live painting by artist David Anthony Geary. Guests of all ages struck their best poses at the photo booth. 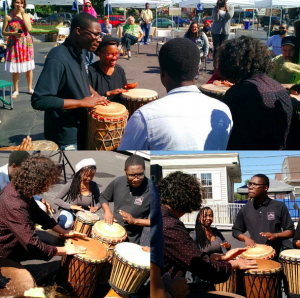 The following day, at the Fresh Beats & Eats Farmers’ Market, Aziz Sahmaoui & University of Gnawa led a jam session and drum circle, encouraging market-goers to participate. The performances were part of the Doris Duke Foundation for Islamic Art Residency Program, which partners with DCASE, the Reva and David Logan Center for the Arts, Old Town School of Folk Music and our community partner The Pakistan Club @ the University of Chicago. Many thanks to all those in attendance, especially the amazing volunteers who helped make CommUNITY Café a success. A special shout out to the bright, young leaders from BuildOn who played a vital role in all aspects of the event! The next CommUNITY Café will be held on October 24, 2015 at the Harold Washington Cultural Center in Bronzeville. Doors open at 6pm, Show begins at 7pm. Stay tuned for more! 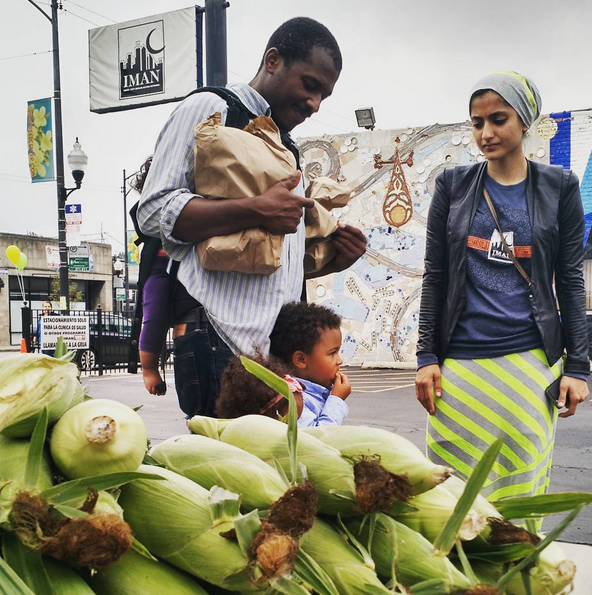 For years, IMAN has been building strong relationships with urban Muslim communities across the country in places such as Detroit, Baltimore, D.C. and New York. 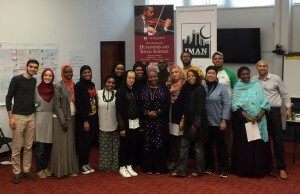 This September saw another promising new development unfold as IMAN organizers traveled to Atlanta for a two-day community organizing training. 20 participants from across the Atlanta area, representing the exceptionally rich Muslim experience in the city, convened on the celebrated Morehouse College campus to collaborate on innovative methods to lift up their communities. Members of the Atlanta Masjid as well as the historic West End community, which is rooted in the extraordinary legacies of Imams WD Muhammad and Jamil El-Amin, joined forces in pursuit of a deeper understanding of IMAN’s proven organizing model. The training focused on learning the basic concepts and language of organizing, sustainably building power, and effectively mobilizing communities from diverse ethnic and socioeconomic backgrounds around common issues. As IMAN continues to expand efforts in Atlanta, we look forward to the future partnerships with the dynamic and inspirational individuals that made this two-day training a success. Unselfish, motivated teamwork captures the spirit of this year’s annual Islamic Society of North America (ISNA) Convention. Coordinating several major efforts at the convention while still supporting regular operations back on 63rd St., IMAN left a lasting impact on both familiar faces and new friends at ISNA. After months of preparation and extended meetings, ISNA finally arrived. Taking full advantage of an ideally situated booth, IMAN staff and leaders shared a beautiful energy and chemistry with convention attendees. A special “campus tour” stole the show though, as nearly 40 guests bused down to the Southwest side to experience firsthand the health, wellness and healing work underway at IMAN. Imam Suhaib Webb and Laila Muhammad joined the tour, sharing insight into why it’s crucial to support the organization. That same day, IMAN was given the 2015 Muslim Humanitarian Award at the Interfaith Humanitarian Banquet hosted by CIOGC. Rounding out the weekend was the a convention-edition Organizing Training lead by Shamar Hemphill, Sara Hamdan and Rami Nashashibi. The demand was high for an interactive opportunity to learn how to organize in the inner city, and participants left feeling motivated and inspired to affect positive change in their own communities. 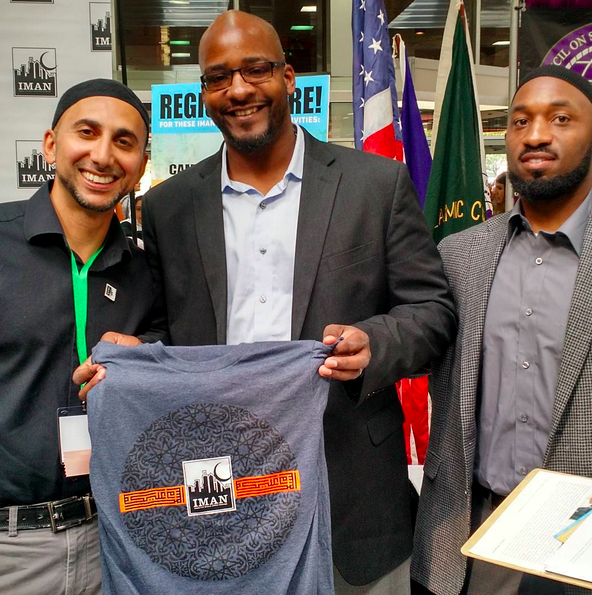 ISNA returns to the Chicago area for next year’s convention, and IMAN awaits another exciting weekend to connect with supporters nationwide. After a summer full of delicious organic fruits and veggies, bands from North Africa to South Chicago and all-ages excitement, the Fresh Beats & Eats Farmers’ Market has ended its inaugural season. 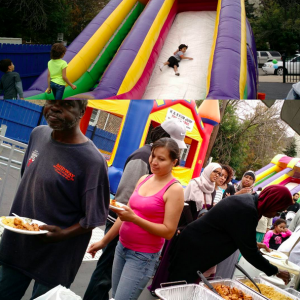 To commemorate the conclusion of the market, as well as the Eid al-Adha holiday, IMAN hosted a special ‘Fresh Beats & Eats Finale’ event on Sept. 27th that was attended by over 150 neighbors and supporters. In addition to an expansive offering of locally grown produce via IMAN and the Growing Power ‘Fresh Moves’ bus, guests also enjoyed complimentary lunch. The soulful sounds of Zeshan Bagewadi and his band competed with the laughs of children playing in the bounce house and on the inflatable slide. To conclude the event, a panel of local faith leaders who’ve lent years of support to IMAN convened onstage to reflect on the themes of sacrifice and family that Eid al-Adha so powerfully reminds us of. One impactful way that Fresh Beats & Eats promoted community health was through its “Double Dollar” program, whereby guests shopping with an Illinois LINK card would receive a matching gift card amount to spend at the market on all purchases up to $20. God willing, the farmers’ market will return in the spring with even more food and fun options available to South Side residents. Thank you to the amazing team of staff, interns and dedicated volunteers who helped make the inaugural year of Fresh Beats & Eats not only possible, but a huge success!